Over 500 new gene regions that influence people’s blood pressure have been discovered in the largest global genetic study of blood pressure to date, led by Queen Mary University of London and Imperial College London. Involving more than one million participants, the results more than triple the number of blood pressure gene regions to over 1,000 and means that almost a third of the estimated heritability for blood pressure is now explained. It appears I still feel that way, particularly when it comes to exercise. Working out in the health club really turns me off. A new report reveals that exposure to green space reduces the risk of type II diabetes, cardiovascular disease, premature death, preterm birth, stress, and high blood pressure. People who bike regularly, either for pleasure or as a way to commute, appear to have a lower risk of cardiovascular disease, according to two separate studies published simultaneously in the American Heart Association’s journal Circulation and Journal of the American Heart Association, the AHA/ASA’s Open Access Journal. My dog and me rounding a turn on Northerly Island, just south of the Chicago Loop. While structured cycling as part of a formal workout routine is already known to guard against cardiovascular illness, little is known about the effects of habitual biking done for leisure or as a way to commute. Together, the findings from the newly published studies suggest that leisure and commuter biking may be an important public health strategy in large-scale efforts to reduce cardiovascular risk. In the Circulation study, 45,000 Danish adults (aged 50 to 65) who regularly biked for recreation or to commute had between 11 percent and 18 percent fewer heart attacks during a 20-year follow-up (1993-2013). The analysis showed that as little as half an hour of biking per week provided some protection against coronary artery disease. Additionally, people who took up biking during the first five years the authors followed them had about a 25 percent lower risk of developing heart disease, compared with those who remained non-bikers in the subsequent 15-year period. Researchers caution that their findings do not prove definitively that riding a bike for leisure or to and from work can prevent heart attacks. However, they say, the lower number of cardiovascular events observed among those who biked on a regular basis is a strong indicator that such activity can boost cardiovascular health. “Finding time for exercise can be challenging for many people, so clinicians working in the field of cardiovascular risk prevention should consider promoting cycling as a mode of transportation,” said Anders Grøntved, M.Sc., M.P.H., Ph.D., senior study author and associate professor of physical activity epidemiology at the University of Southern Denmark. Researchers also tracked participants’ overall exercise habits, activity levels and frequency of bicycle riding, along with heart disease risk factors, such as blood pressure, weight, cholesterol, smoking, diet and alcohol consumption. Participants were asked to provide information about cycling habits at the onset of the study and once more in five years. In all, there were 2,892 heart attacks during the 20-year follow-up. Researchers estimate that more than 7 percent of all heart attacks could have been averted by taking up cycling and keeping it up on a regular basis. “Because recreational and commuter biking is an easy way to make physical activity part of one’s routine in a non-structured and informal fashion, based on the results, public health authorities, governments and employers ought to consider initiatives that promote bicycle riding as a way to support large-scale cardiovascular disease prevention efforts,” said Kim Blond, M.Sc, lead author and research assistant at the University of Southern Denmark. The Journal of the American Heart Association study revealed that middle-aged and older Swedish adults who biked to work were less likely than non-bikers to be obese, have high cholesterol, high blood pressure or pre-diabetes — all critical drivers of cardiovascular risk. Researchers followed more than 20,000 people in their 40s, 50s and 60s over 10 years and monitored their commuting habits, weight, cholesterol levels, blood glucose and blood pressure. At the beginning of the study, active commuters (biked to work) were 15 percent less likely to be obese, 13 percent less likely have high blood pressure, 15 percent less likely to have high cholesterol and 12 percent less likely to have pre-diabetes or diabetes, compared with passive commuters (used public transportation or drove to work). During a follow-up exam 10 years later, the portion of study participants who switched from passive commuting to active commuting also had an improved risk profile. They were less likely to be obese, have diabetes, hypertension or elevated cholesterol, compared with non-bikers. Collectively, at the 10-year follow-up, those who maintained biking or took up biking at some point had a 39-percent lower risk of obesity, 11 percent lower risk of high blood pressure, 20 percent lower risk of high cholesterol and 18 percent lower diabetes risk. Researchers noted that there was no minimum amount of time or distance required to reduce one’s risk, even though people who biked longer or more often experienced small additional gains in risk reduction. Because the study was observational, it is difficult to establish a cause-and-effect relationship between improved cardiovascular health and commuter biking, but the findings do indicate a strong cardio-protective effect from cycling. Based on their findings, researchers also estimated that maintaining biking habits or switching from passive commuting to biking may have prevented 24 percent of obesity cases, 6 percent of hypertension diagnoses, 13 percent of high cholesterol diagnoses, and 11 percent of the cases of diabetes. As regular readers know I pretty much ride my bike every day here in Chicago. I say ‘pretty much’ because several years ago, my doctor told me that I shouldn’t be doing my big rides in high temperatures. I said that I felt I was in great shape and my body could handle it. She answered that she said the same thing to her 40-year-old patients. Extreme heat puts the body under special stress and it is not wise to actively exercise in those conditions. Here I am riding with my dog in the annual Bike the Drive ride in Chicago down Lake Shore Drive. As a Memorial Day ride, the temps rarely hit high extremes. Now, it seems that now only high temp extremes, but also large intra-day changes can be damaging, according to a study being presented at the American College of Cardiology’s 67th Annual Scientific Session. It states that large day-to-day swings in temperature were associated with significantly more heart attacks in a study being presented at the American College of Cardiology’s 67th Annual Scientific Session. Medical researchers at Trinity College Dublin, Ireland, are advising caution when treating blood pressure in some older people — after results from a study contrasted with recent advice from the U.S. to attempt to aggressively lower blood pressure in all adults to targets of 120mmHg. Researchers from the Irish Longitudinal Study on Ageing (TILDA) at Trinity College Dublin, in collaboration with Beaumont Hospital, Dublin, have recently published the findings in the Journal of the American Medical Association (JAMA Internal Medicine). A large randomized blood pressure trial led by U.S. investigators — the Systolic blood Pressure Intervention Trial (SPRINT) — demonstrated that lowering systolic blood pressure to levels of 120mmHg or less compared with 140mmHg or less in adults (over 50 years with cardiovascular risk) significantly reduced death (from all causes and from heart failure and heart attacks). The study also reported that common side effects of low blood pressure such as falls, injuries, blackouts, and drops in blood pressure after standing were not increased by aggressive treatment — even in people over 75 years old. Because the latter findings were clinically counter intuitive, the TILDA team tested whether they held true outside of a trial setting. Focusing on people in Ireland over 75 years, they examined rates of falls, injuries, blackouts and excessive drops in standing blood pressure in those who met the criteria for the treatment proposed in SPRINT and were followed up with for 3½ years — the same time period as SPRINT. The researchers reported starkly contrasting results — falls and blackouts were up to five times higher than reported in SPRINT and drops in blood pressure on standing were almost double that reported in SPRINT. Therefore, in people over 75 years, intensive lowering of blood pressure to 120mmHg could result in harm and TILDA researchers recommend that a better understanding of who, over 75 years, will or will not benefit, is necessary before widespread adaptation of the SPRINT results. The TILDA team is now assessing how best to determine which people may benefit from SPRINT, and which people are more at risk from aggressive blood pressure lowering. Advances in technology have made it possible for us to take measurements of our body that previously we had to rely on doctor visits to get done. This is a positive development that saves us time and money – on the assumption that we can do as accurate a measurement as the hospital. Seems that is not necessarily the case with home blood pressure monitors. Seventy per cent of readings from home blood pressure monitors are unacceptably inaccurate, which could cause serious implications for people who rely on them to make informed health decisions, new UAlberta research reveals. Here is yet another reason to be sad about the SAD – Standard American Diet. A new study by Keck School of Medicine of the University of Southern California researcher links increased dietary potassium with lower hypertension. Consuming potassium-rich foods like sweet potatoes, avocados, spinach, beans, bananas — and even coffee — could be key to lowering blood pressure, according to a USC researcher. Ignorance about blood pressure is widespread. Harvard Medical School reports “Blood pressure has long been one of the best markers of your health. It is a number you can remember and monitor. High blood pressure (hypertension) is linked to a greater risk of heart attacks and strokes. You can have high blood pressure, or hypertension, and still feel just fine, according to the National Institute on Aging (NIA). That’s because high blood pressure often does not cause signs of illness that you can see or feel. But, high blood pressure, sometimes called “the silent killer,” is very common in older people and a major health problem. • 24-hour ambulatory, or around-the-clock monitoring, during daily activities revealed undetected high blood pressure among otherwise healthy adults who had normal readings in the clinic. I have written time and again about the link between exercise and brain health. The Harvard Heart Letter has a nice post on how heart disease and brain health are tied together. “Just like in the rest of your body, advancing years can take a toll on your brain function. Much of this slowing down is predictable and can be chalked up to normal aging. However, when thinking skills become increasingly fuzzy and forgetfulness gets to be a way of life, an early form of dementia known as mild cognitive impairment may be setting in,” so writes Julie Corliss, Executive Editor, Harvard Heart Letter. Regular readers know that I feel strongly that sleep is one of the cornerstones of good health. You can check out my Page – How important is a good night’s sleep? for more details. • Poor sleep – even if you don’t have sleep apnea – may be linked to higher risks of developing an irregular heartbeat. • In addition, getting less rapid-eye movement (REM) sleep may also be linked to higher atrial fibrillation risks. My family history of Alzheimer’s Disease and dementia popped this news item up onto my radar screen. Before considering problems with high blood pressure, let’s understand what it is. Blood pressure is the force of the blood pushed against the the wall of the arteries. It depends on the strength of the heartbeat, thickness and volume of the blood, the elasticity of the artery walls and general health. It is the arterial pressure of the circulation, a dynamic process that fluctuates all day. Normal BP is 120/80, systolic/diastolic. Prehypertensive is 120-139 over 80-89. Stage one hypertension is 140-159 over 90 – 99. Stage two hypertension reads 160 -179 over 100 – 109. As a senior citizen, I know that high blood pressure is very widespread. I used to think it was about the same as having grey hair. But, I was wrong. “About one out of three adults has high blood pressure, which is usually defined as a reading of 140/90 millimeters of mercury (mm Hg) or higher. “The first, or upper, number (systolic pressure) represents the pressure inside the arteries when the heart beats, and the second, or lower, number (diastolic pressure) is the pressure between beats when the heart rests. Blood pressure is the force of blood pushing against the walls of arteries. When the doctor measures your blood pressure, the results are given in two numbers. The first number, called systolic blood pressure, is the pressure caused by your heart pushing out blood. The second number, called diastolic blood pressure, is the pressure when your heart fills with blood. The safest range, often called normal blood pressure, is a systolic blood pressure of less than 120 and a diastolic blood pressure of less than 80. This is stated as 120/80. One reason to have regular visits to the doctor is to have your blood pressure checked. The doctor will say your blood pressure is high when it measures 140/90 or higher at two or more checkups. He or she may ask you to check your blood pressure at home at different times of the day. If the pressure stays high, even when you are relaxed, the doctor may suggest exercise, changes in your diet, and medications. The term “prehypertension” describes people whose blood pressure is slightly higher than normal—for example, the first number (systolic) is between 120 and 139, or the second number (diastolic) is between 80 and 89. Prehypertension can put you at risk for developing high blood pressure. Your doctor will probably want you to make changes in your day-to-day habits to try to lower your blood pressure. What if Just the First Number Is High? Regular readers know that I am strongly concerned about my health, both physical and mental. At least two of my family members have suffered from Alzheimer’s and dementia. So, I was thrilled to learn that the Alzheimer’s Association thinks there are links between heart health and brain health. “Growing evidence suggests a close link between the health of the heart and the health of the brain. The brain is nourished by one of the body’s richest networks of blood vessels. With every beat, the heart pumps about 20 to 25 percent of the blood to the head, where brain cells use at least 20 percent of the food and oxygen carried by the blood in order to function normally. As a result, many factors that damage the heart or blood vessels may also damage the brain – and may increase the risk for developing Alzheimer’s disease and other dementias”, according to the Alzheimer’s Association (AA). • Smoking: There is fairly strong evidence that current smoking increases the risk of cognitive decline and possibly also dementia, and that quitting smoking may reduce the associated risk to levels comparable to those who have not smoked. • Diabetes: Diabetes is associated with lower cognitive performance, and there appears to be strong, but not conclusive, evidence for an association between diabetes and dementia. • Obesity: Mid-life obesity increases the risk of cognitive decline and may also be associated with an increased risk of dementia. • High Blood Pressure: High blood pressure, or hypertension, especially in midlife, has been shown to be associated with a higher risk of cognitive decline. Some evidence has also shown that medi- cine for treating high blood pressure may be effective in reducing the risk of decline. “What’s good for your heart may in fact be good for your brain, too. Physical activity is one such factor that not only protects the heart but improves cognitive function and may also protect against dementia. And, some emerging evidence suggests that consuming a heart-healthy diet may also protect the brain. To read further on this check out my Page – Important Facts About Your Brain (and Exercise). A new imaging technique found that some people with high blood pressure also have damage to nerve tracts connecting different parts of the brain, according to a study presented at the American Heart Association’s (AHA) 2015 High Blood Pressure Conference. The area of brain damage detected is linked to difficulties in certain cognitive skills, decision-making, and the ability to regulate emotions. “We already have clear ways to explore the damage high blood pressure can cause to the kidneys, eyes, and heart. We wanted to find a way to assess brain damage that could predict the development of dementia associated with vascular diseases,” said Daniela Carnevale, Ph.D., the study’s senior author and assistant professor at Sapienza University of Rome, based in Neuromed Institute. While there has been a lot of research on hypertension-related brain changes in the grey matter, Carnevale proposed that a look into the brain’s white matter could tell if high blood pressure was having an effect even earlier than what is known. Researchers used diffusion tensor imaging (DTI), an enhancement of magnetic resonance imaging (MRI), to evaluate and compare the structural and functional properties of the main connections between different brain regions. Fifteen participants were on medication for moderate to severe high blood pressure and 15 participants had normal blood pressure. Participants were also given a cognitive assessment. • limbic system fibers, which are involved in attention tasks. In addition, imaging and laboratory tests indicated damage to the heart and kidneys from high blood pressure. Researchers also found those with high blood pressure performed significantly worse on two different assessments of cognitive function and memory. However, there were no differences in tests evaluating verbal function or ability to perform daily activities. “DTI provides a way to evaluate pre-symptomatic brain damage in people with high blood pressure in order to identify possible therapies to help control brain damage and reduce the eventual development of dementia. It is generally accepted that not all available medications have the same impact on different kinds of organ damage,” Carnevale said. 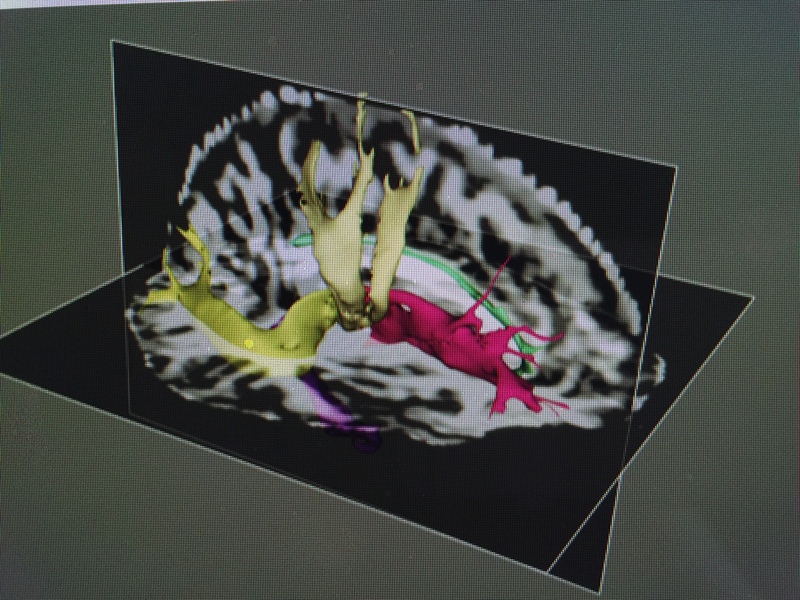 DTI, also called tractography, is not performed in routine medical practice, but the researchers suggest that physicians should start to consider potential brain damage as they treat patients with high blood pressure. More than 75 percent of sodium in the U.S. diet is found in the salt added to processed food. In the United States, about 9 of every 10 people consume too much sodium. The Salty Six foods – breads and rolls, cold cuts and cured meats, pizza, poultry, soup and sandwiches – are the leading sources of overall sodium in the U.S. diet. Because of this it is really important to beware of eating processed food. Lots of folks cut down on their table salt, but that isn’t the real culprit in the sodium problem. They need to beware of the stealth sodium in the processed foods they eat. How Much Salt is Too Much Salt? Where Does All the Salt in our Diet Come From? People who gradually increase the amount of salt in their diet and people who habitually eat a higher salt diet both face an increased risk of developing high blood pressure, according to a study published in the Journal of the American Heart Association. In a Japanese study of more than 4,000 people who had normal blood pressure, almost 23 percent developed high blood pressure over a three year period. Those who ate the most salt were the most likely to have high blood pressure by the end of the study. Participants who gradually increased their sodium intake also showed gradually higher blood pressure. The researchers estimated the amount of salt an individual was consuming by analyzing the amount of sodium in the urine of people who were visiting their healthcare provider for a routine check-up, and conducted follow-up urine analysis for approximately three years.